Coffee? From GE Refrigerators? Yup! I’m addicted to two things. Rotisserie chicken and coffee. If I had to pick one of those two, I wouldn’t hesitate to eliminate the chicken and stick with coffee. I’m a connoisseur of coffee. A fiend for French Roast. A junkie for java. So you can imagine how elated I was when I found out about a new feature in two of GE Café’s French Door refrigerators: they make coffee! Model CYE22USHSS available in stainless steel only. 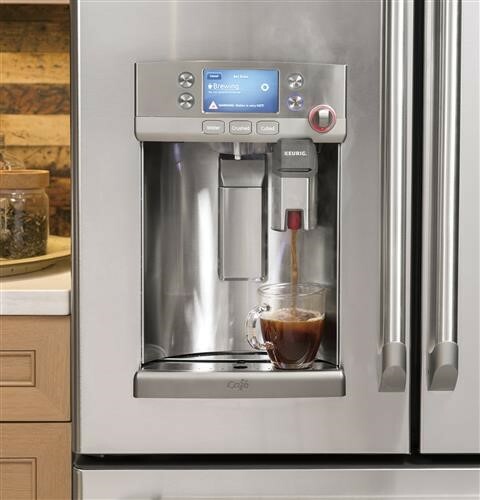 Coffee from your refrigerator is now a reality with GE’s K-Cup Brewing system that’s included with models CYE22USHSS and CFE28USHSS. 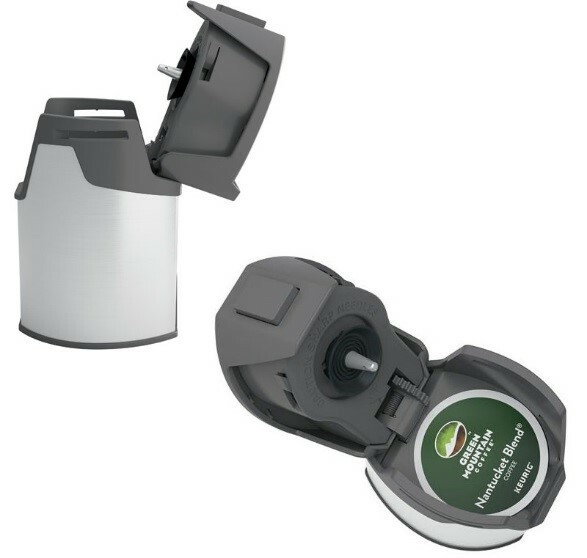 Simply place any K-Cup flavor inside a container that comes with either refrigerator and then attached the container to the external dispenser. In moments, you’re enjoying a piping hot cup of Joe without a Keurig machine taking up vital real estate on your counter. Coffee is ready in moments and, coincidentally, your day just got way better. Do you need a counter-depth refrigerator with K-Cup? No problem. Select model CYE22USHSS. With 22.2 cubic feet of capacity and GE Café’s pro-styling, this refrigerator qualifies as Energy Star and includes a full-width temperature controlled drawer (three different temperature settings), LED lights, and 84 percent of the refrigerator is made in America. Need a more spacious interior? Again, not a problem. Select model CFE28USHSS. This bad boy features 27.8 cubic feet of capacity and includes the same bells and whistles as their counter-depth unit. 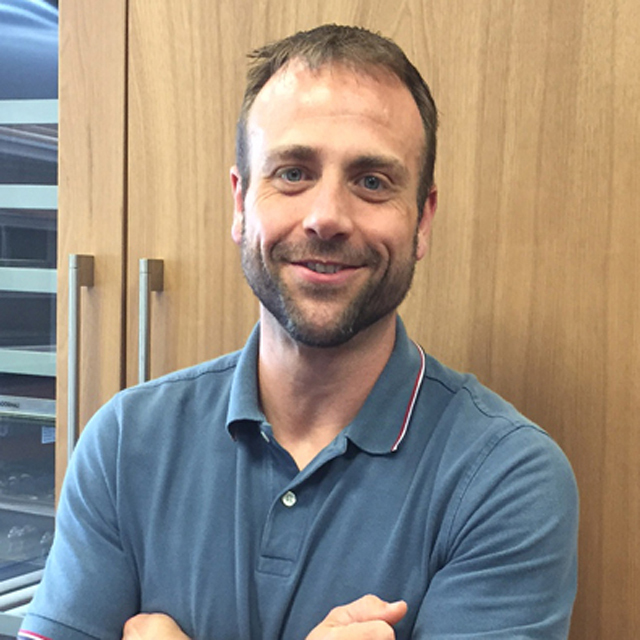 If you need a quick read on the differences between counter-depth vs. full-depth refrigerators, check out this nifty post. Precise Fill: The water dispenser reacts to the amount of water you need. Chooses how many ounces or cups you want, and the perfect amount dispenses each time. Hot Water Scheduling: With the GE Kitchen App, you’re able to pre-set times so your hot water is ready any time of day. I’m pretty sure that when Thomas Edison founded what was to become GE back in 1890, he had no idea what would be created over the next 100 years. Can you imagine what appliances will be available in the next 100 years? 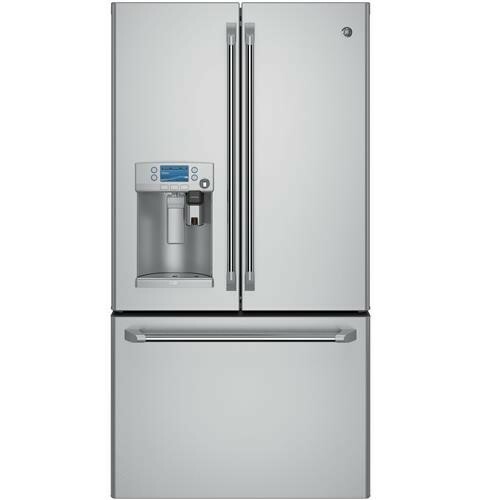 If you want to check out GE Café’s French door refrigerator with K-Cup Technology, we’ll have it on display very soon. Call us at 215-699-3522 to make sure it’s here. Until next time, America!